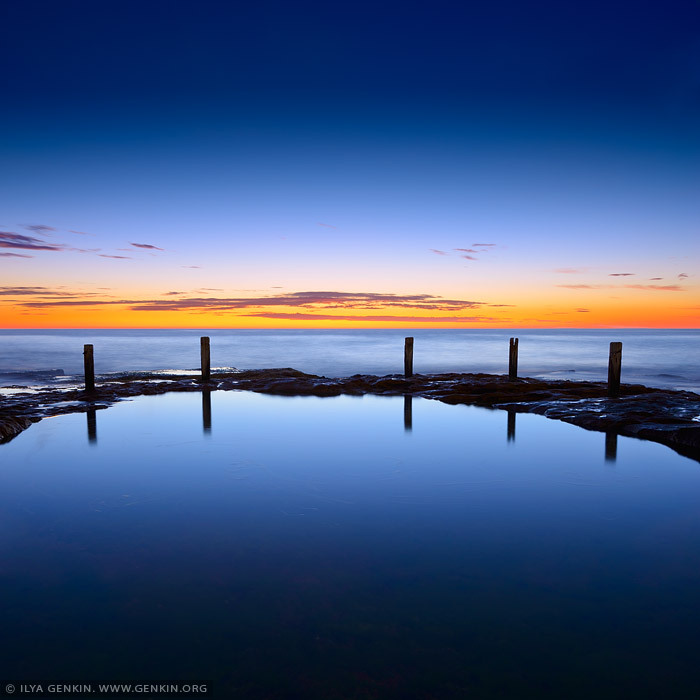 Blue Sunrise at Ivo Rowe Pool in Coogee, NSW, Australia. It is one of four rock/tidal pools in Coogee area. The other pools are Coogee Baths, the Ladies Pool and Wylies Baths. It is tiny tidal pool located on the rock platform at South Coogee. The Ivo Rowe Pool is a little gem for photographers as allows to create minimalist photography with incredible rocks that surround this little hole in the rocks. This image belongs to the travel and nature stock photo library. This stock photo of Ivo Rowe Pool at Sunrise is available for licensing for commercial and editorial uses including websites, blogs, books, magazines, brochures and advertising. Restrictions may apply for images which contain third party copyrighted material or sensitive subjects. Photos of artwork are for editorial use only. This image id AU-IVO-ROWE-POOL-0002 of Ivo Rowe Pool at Sunrise, is copyrighted © by Ilya Genkin. This is not a public domain image.